The technology is neat I agree. But does anyone building these things understand how currencies actually work beyond the nature of a peer-to-peer relationship? If the derived "currency" is deflationary, I don't see how it works. The blockchain is neat for sure, but that's the non-currency juice of this fruit. This one always puzzles me, why aren't you a conservative? The entire liberal ideology is based on people being slaves to circumstance and that's why the world needs to have more equal outcomes. You clearly get that *YOUR* actions have made you successful. Your choice to delay gratification. Your choice to keep your nose clean, work hard and prosper. The idea that hard work is generally rewarded is not necessarily inconsistent with the idea that some people have such a substantial advantage or disadvantage that hard work will make a minimal difference. Incidentally, the GOP position on social issues and now on Trump makes it all but impossible for classical liberals with high education or those who live in urban areas to support the party. These posts made me see how we talk past one another on important topics. Lewk took wiggin's post and turned it into conservative vs liberal ideology. Loki stepped in and moved it to a practical, political observation. The truth is that a stock/investment thread like this is interesting and fun for people actually 'invested' in Wall Street, but that's less than half the US population. And it's certainly not an accurate portrayal of the overall economy, but just one indicator that mostly reflects expectations, including those irrational animal spirits that see risk as opportunity. Another truth is that working hard, delaying gratification, and saving money is no longer a way toward prosperity, Lewk. Even if you've got a college degree and a good job, the cost of rent/home ownership makes it nearly impossible to save your way to wealth. Especially if you've got student loans, plus other debts like car loans or credit cards. It's no longer feasible to stash money in a savings account and let it grow, because it doesn't accrue enough interest to keep up with inflation. Make no mistake -- we don't value hard work and saving money, as a society. We value debt, credit, and taking risks. We've monetized gambling schemes. Even our educational system is one big crap shoot. Last edited by GGT; 02-03-2018 at 03:44 AM. And here it comes, the market readjusting (normalizing?) itself downward, in response to good global economic data. It's unfortunate that just a hint of US wage growth can make corporations worry about their profit margins, since the Fed will probably raise interest rates from abnormal lows, making their debt a bit more costly. The end of practically free institutional debt should be a good thing, even tho it makes gov't debt more expensive, and Trump's tax cuts just added to our deficit. And the volatility swings aren't good for anyone but speculators and high frequency traders. I invested quite a bit into Antshares in June (now rebranded to NEO). 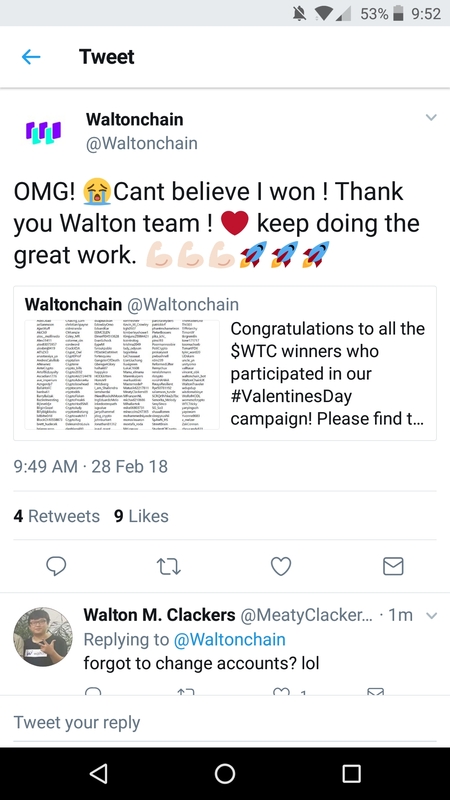 I made a good amount from Waltonchain as well. Wondering now how far BTC will go on this run and when the altcoins will make a comeback. I'd suggest abandoning Waltonchain if you're still holding it. I sold my WTC a while ago so I wasn't affected by that drop. Tulips? Probably more than 95% of these projects aren't going to go anywhere. But there are a few AMZNs in there. There are no fundamentals. Crypto-currency advice is based entirely on the psychology of the market. Short term, sure. It is all speculation still. Cryptocurrencies and blockchain/DAG technology are still in the infancy stage. Only if you invest in things you don't understand. I mean, he's speaking more theoretically than speaking about an imminent issue. But certainly folks who sold into the 2008 crisis (either because they thought it was a good idea or needed to for other reasons) had that happen. It's only "theoretical" if you've already got enough wealth to weather the downturns. It doesn't matter much to lose half your wealth, if you've already got millions or billions to begin with (or another 50 years to turn a profit). Swimming without trunks when the tide goes out is a Buffet metaphor, but how does that inspire confidence in the "fundamentals" of market investing from people treading water? Finally the market realized they were tulips. Indeedy. Though I was pleased to read a New Yorker profile about the origins of Etherium that seemed to indicate they were at least somewhat thinking beyond the short-term hustle and visions of post-government lolbertarianism to long-term applications of this stuff. Meanwhile, I'm getting nervous about the municipal debt market again. Everyone freaked out about municipal borrowing after the financial crisis, but the sky didn't fall because rates were so damn low. As rates go up, I suspect this problem will surface again. Either way, rates going up promises broad-based asset class declines. Why the hell didn't we pass a broad, national infrastructure bill when interest rates were below zero? Crypto-currency has the disadvantages of cash and the disadvantages of digital money. If you put your wallet online, like in a cloud, it can be stolen and used. If you have it in your computer, it can be stolen and used. If you have it in a flash drive, it may fail. Make a copy and it can be lost, stolen, and fail. With latest Windows 10 bugs that deleted flash memory, you may lose your wallet without a fail. Macroeconomically, money should be printed when production increases. If production grows faster than money printing, prices go down. If production grows slower than money printing, prices go up. Spanish empire printed money (mined gold) way faster than production and that led to an inflation crisis that lasted a century. Gold is not "printed" at the same pace of production and not all nations have gold. Normal money is easy to print, and it is printed by central banks. Cryptocurrency printing depends on computing power, and anyone with money can print money. All currencies are fiat money. When a currency is worthless, having anything material to bailout, makes no difference. Last edited by ar81; 12-06-2018 at 02:00 PM.